Today’s protest takes place as the Minister responsible for fracking, Greg Clark, is poised to decide on whether to allow the first new UK fracking to commence since 2011. A group of grandparents and elders have chained themselves together in a government department building in Westminster this morning to urge the government to oppose “dangerous” fracking. 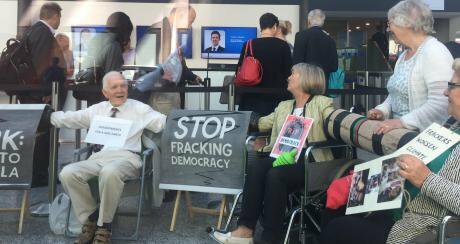 Aged between 63 and 82, the 10-strong group from the South West - Grandparents for a Safe Earth (GFASE) - have occupied the Westminster building to demand that the Secretary of State for the Department for Business, Energy and Industrial Strategy Greg Clark refuse permission for fracking. The group smuggled chains, banners and other protest-related equipment into the department under their clothing and in wheelchairs. Half the group focused on creating a diversion while the other half “locked on” to each other in the foyer. The direction action comes as campaigners await the government’s decision whether to grant permission for energy firm Cuadrilla to begin fracking (hydraulically fracturing) at a site in Preston New Road, in Lancashire. Cuadrilla aims to start large-scale fracking in the UK having completed the UK’s first ever horizontal shale gas well at Preston New Road in April. If consent is granted, the well will be the first fracked in the UK since 2011, when fracking work was suspended after fears it had caused earthquake tremors near Blackpool. The group of grandparents and elders had planned a similar action at the Preston New Road site, but redrew their plans after Cuadrilla secured an expanded injunction against protesters at the beginning of this month. Those who break the injunction face being jailed, being fined or having their assets seized. Organised in collaboration with anti-fracking group Reclaim the Power, the direct action forms part of Break the Chain 2018, a fortnight of direct actions targeting the fracking industry, its supply chains and political support (11-24 June). GFASE’s previous climate-related demonstrations have included a mock funeral - walking through the streets of Bristol carrying a coffin to represent the lives lost to climate change in developing countries - and handing out mince pies and mulled wine in front of an RBS bank branch to protest the bank’s financing of polluting industries.